Workers from ILC Dover and NASA Langley inflated and tested the Inflatable Re-Entry Vehicle Experiment (IRVE) (Credits: NASA/Sean Smith). NASA technicians and engineers are putting the finishing touches on a unique experiment designed to demonstrate that an inflatable aeroshell/heat shield could be used to protect spacecraft when entering a planet’s atmosphere or returning here to Earth. 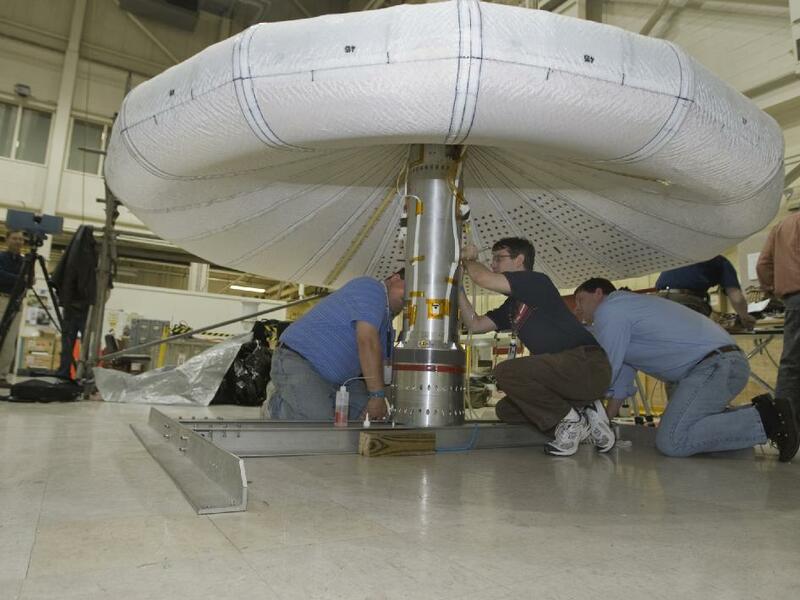 Workers from NASA’s Wallops Flight Facility on Virginia’s Eastern Shore and NASA’s Langley Research Center in Hampton, Va., are preparing the Inflatable Reentry Vehicle Experiment (IRVE-3) for launch from Wallops as early as July 21. IRVE-3 is one of NASA’s many research efforts to develop new technologies to advance space travel. It’s part of the Hypersonic Inflatable Aerodynamic Decelerator or HIAD project — within the NASA Space Technology Program’s Game Changing Development Program. “We have developed a 10-foot (3 meters) diameter heat shield that we are packing — uninflated — into the 22-inch (56 centimeters) diameter nose cone of a three-stage Black Brant XI sounding rocket,” said Robert Dillman, IRVE-3 chief engineer. The inflated structure will protect a payload that consists of four segments including the inflation system, steering mechanisms, telemetry equipment and camera gear. The heat shield is a cone of inflatable rings, which when filled with nitrogen look a little like a giant stacking ring toy or a mushroom. The rings are covered by a high-tech blanket or thermal protection system that is made up of layers of heat resistant materials. According to engineers fitting the inflatable structure into the rocket wasn’t as difficult as folding up its cover. 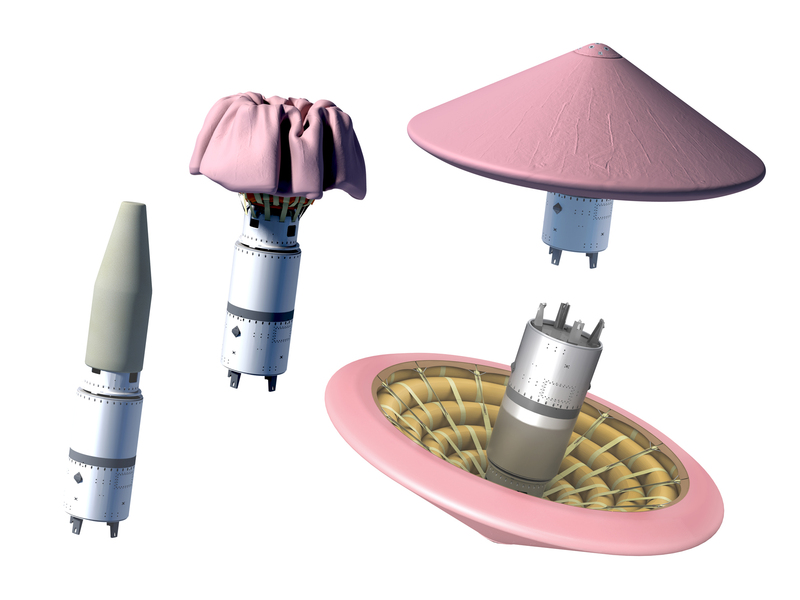 The different configurations of IRVE, from packed to inflated (Credits: NASA). The IRVE-3 needs that kind of insulation because of the force of entry into Earth’s atmosphere and temperatures that may reach as high as 1,850 degrees Fahrenheit (1,010 degrees Celsius). To achieve realistic reentry heating, the rocket will launch the inflatable spacecraft technology about 280 miles into the air. The 680-pound (308 kilograms) IRVE-3 will separate from the rocket and cutters will snip the strings on the inflatable’s restraining bag, allowing the inflation system to pump the Kevlar rings to the right pressure. Then the inflatable heat shield and its payload will plummet back through Earth’s atmosphere, splashing down in the Atlantic Ocean about 20 minutes after launch — 350 miles (563 kilometers) down range from Wallops. During reentry four video cameras will transmit images to the Wallops control room to confirm that the IRVE-3 is holding its shape. Instruments on board will also send temperature and pressure data to researchers. It sounds so simple when the engineers describe it, but nothing could be further from the truth. Way before launch day there have been literally years of designing, fabricating and testing to try to make sure everything goes right. About 50 people have worked for more than three years to make the experiment happen. This will be the third IRVE suborbital flight. But why pursue inflatable spacecraft technology development in the first place? According to engineers such a system could offer more flexibility for future missions, by reducing some of the size and weight restrictions that are part of the rigid aeroshells we currently use for planetary exploration. An inflatable heat shield could accommodate larger payloads that could deliver more science instruments to other worlds and allow us to land at higher elevations on planets such as Mars or bring gear safely back from the International Space Station.